Disclaimer: I received a free review copy of this game from Nintendo. Opinions expressed in this review are my own. Nintendo may have ignored your cries for a new F-Zero game, but you can still count on indie developer Shin'en to deliver a polished futuristic racing game to scratch that itch for you. 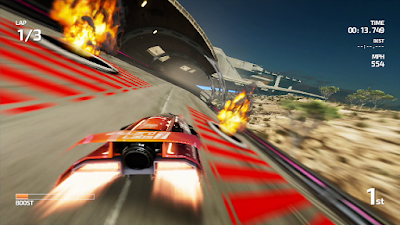 Available from the Nintendo eShop on Wii U, FAST Racing Neo offers a high speed racing challenge that finds a happy middle between F-Zero and WipEout. Note that the videos in this review are in 30fps while the game runs at 60fps. It'll look even better on your TV. The gameplay is fairly simple: get energy spheres to fill your boost meter (usable at any time), and switch between blue and orange phases in order to pass over boost strips and jumps of the corresponding colors (getting it wrong will slow you down). Of course, skillfully taking turns, flying off jumps, and avoiding or boosting into other racers are all as important as ever. Don't let the apparent simplicity fool you though - at high speeds, managing the turns and phase shifts is no easy task, and with three speeds and a "Hero Mode", the game offers enough challenge for even experienced gamers. Thankfully, the controls are perfectly responsive and intuitive, so all of the challenge comes from good design and not from wrestling with controls. There's also an option for motion controls if that's your thing, and the game supports basically every controller you can connect to a Wii U (except GameCube controllers and the Wii Fit Balance Board). There are sixteen tracks which are all beautiful, unique from each other, and well-designed. They're divided into four cups which you'll be playing through on each of the three speeds / difficulties. Clearing a cup will unlock the next one, and often a new vehicle as well (of which there are ten in all). Each vehicle handles a bit differently according to its weight, but mainly they differ in their top speed and acceleration stats. Beyond grand prix, you can also shoot for a fast time on each course (on each speed, no less) in Time Trials, and every course on every difficulty has a developer time for you to try to beat. Unfortunately though, you can't save ghosts or replays in Time Trials, so that's kind of a bummer. On the other hand, there is an online ranking system, even for your grand prix times, so you can see the world record time and your own ranking. (Update: It seems that there is only online ranking for Grand Prix times and not for Time Trials. Weird.) There's also "Hero Mode", which is unlocked for tracks you've cleared on the highest speed. In this mode, you must get first place to win, crashing will put you out of the race (normally you'd respawn, which is punishing but still recoverable), courses are mirrored, and you have a health meter / boost meter combo as in F-Zero. Unfortunately, from what I can tell, there isn't any incentive to beat the developer times in Time Trials or clear each track in Hero Mode beyond increasing your completion percentage. It would've been nice if there were unlockable skins or online badges or something. As for multiplayer options, you can play offline in splitscreen with up to four players, or online in groups of eight (but with only one local player). Performance-wise, everything works very smoothly in multiplayer and I didn't have any issues with lag (although I was rarely close enough to other players to see if they were lagging). When playing online, courses are chosen from a random selection of three (like in Mario Kart), but the three that each player has to choose from may be different, so it's usually a surprise as to which course gets picked. There's also a scoring system through which you earn points according to how well you place in each race. Unlike in Mario Kart, it seems that you can't lose points, so it's more of a record of how long you've played rather than how well, since even an unskilled player can rack up a lot of points if they play enough. Oh, and yes, you can play with friends online, but only in a single lobby that any of your friends can join. Now for the bad news... There are no options for online play. Even with friends, only a single speed is available and you can only choose from the random selection of three tracks each time. At this point, you can't play Hero Mode online either (and honestly, I couldn't even find a way to play it in offline multiplayer). But back to the positive side, the graphics are very pretty and the game runs at a steady 60 frames per second. The soundtrack is good and sets the mood for fast-pace racing, though admittedly it's not very memorable either. Oh, and the GamePad mirrors the TV at all times, so playing without a TV is possible. FAST Racing Neo's core gameplay is fast, responsive, and delightfully skill-based, the courses are all well-designed, and the graphics and frame rate are fantastic. But the fact that it's so polished and so darn fun overall just makes its faults all the more regrettable: no options online, no incentive to do most of the modes, and no ability to save time trial ghosts. In spite of that, for the price, I can confidently recommend FAST Racing Neo to fans of the genre. It might not quite be enough to replace F-Zero, but it's surprisingly close. 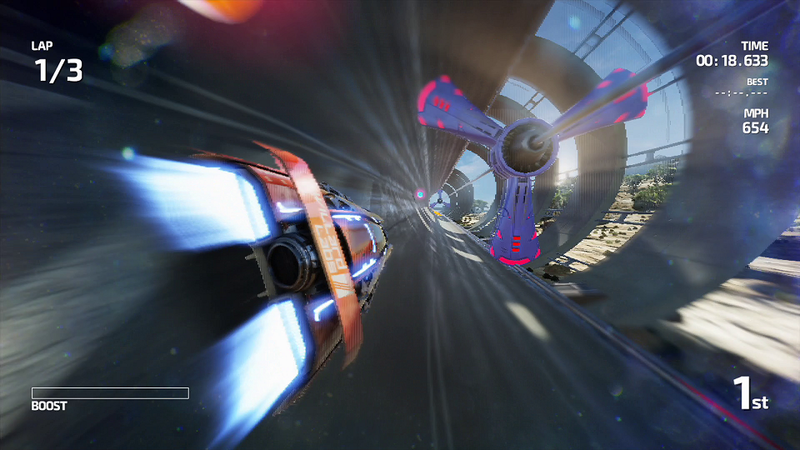 For readers who are familiar with F-Zero and WipEout games, here are some comparisons. Vehicles are few (10 racing at once) and large, making FAST Racing Neo more similar to WipEout in that regard. On the other hand, the sense of speed, track design, and item-less gameplay made it feel somewhat more similar to an F-Zero game, in my opinion. But the vehicle handling also isn't as sensitive as in F-Zero in that you won't be making any sharp U-Turns (the courses are designed with this in mind though). Like I said at the start of the review, I feel that FAST Racing Neo is a nice middle ground between WipEout and F-Zero, so fans of both series ought to enjoy it. You might also be interested in this article I wrote a few years ago about my ideas for building the next F-Zero game.